I made yarn! I spent a lovely, rainy, foggy Monday vacation day spinning the Corriedale batt I purchased from Grafton Fibers at Rhinebeck. This was such a pleasure to spin! I’d forgotten how soft Corriedale can be, and how lofty it is. The skein is 392 yards of a two-ply yarn that looks like it’s about DK or even sport weight (Wraps per inch? Eh.). 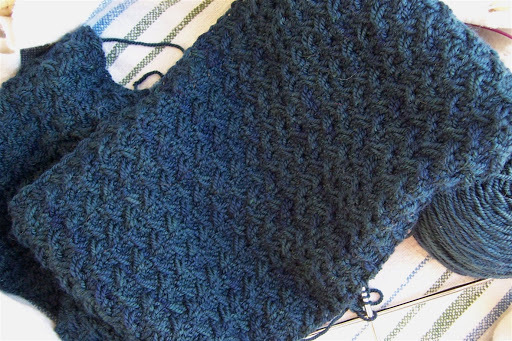 It is asking to become mitts or mittens, and a little scarf. I have a couple of ounces of fiber left to spin, but all I know is that I have been pacing the floor while this yarn dries so I can wind it and start knitting. Luckily, I read Margene’s post yesterday about her latest mitts adventures, and I ordered two patterns from Anne at Knitspot — Fine Cabled Mitts and Delicato Mitts. I’m sure I can adjust either of the patterns to work with my yarn. Who knows what will become of my own adventure? I’m enjoying all the knitting I have going on. I knit a little each evening on the Shifting Sands/Midnight Waters (?) scarf. Here’s what I have so far, which is about 30 inches. I’m so convinced that no photograph will do this yarn justice that I’ll be surprised if it actually does! I’ve been working on a red scarf and the second Lenten Rose sock, too. I guess this means that at the moment I’m a process knitter, doesn’t it? I have plenty of time for all my projects, and I like this feeling of opening up the box of chocolates and choosing whatever strikes my fancy. There’s a lot of reorganizing and shifting (and book-hauling) going on at work, so I’ve been coming home late and weary. Not that brain-dead summer or holiday weary, though, so I still have energy for knitting in the evening. :: The Saga of the Crock-Pot: Found at last. A Rival 3-quart round crock-pot, decorated with a dumb little fruit and veggie border, but that fits my needs just perfectly. Now that I have it, I have to use it, don’t I? So far I’ve made chicken with salsa. Whoop-de-do. :: The Saga of My Jaw: Resolved, even though the answer is to have a wisdom tooth pulled. I’m one of the lucky few whose wisdom teeth have never caused any trouble, until now. Luckily it’s not an urgency, and the dentist did a quick fix. Now I can wear my clench-preventing night guard again, and I feel almost all better! We have Real Winter here — it’s not going to reach 32F, I don’t think. I know, I asked for it. I have my usual Wednesday errands to do, and after that, you’ll find me curled up with some Corriedale yarn and a cup of tea! You see? I just KNEW we were kindred spirits … my wisdom teeth came in perfectly and have never caused me a moment of trouble or pain ::knocks on wood::I love the yarn you’ve spun. It even looks soft in the picture.Love Ya! I love the yarn! Can’t wait to see what you knit with it. I love your analogy to chocolates. Yes, that’s what the knitting can be. A little of this, a little of that and it all tastes good but different. I can’t pick a large project right now, I’ve been using the sock knitting to work it out. But I will be bringing something simple tomorrow! And I’ll bring you a slow cooker cook book as well. Definitely Midnight Waters! 🙂 Lovely to have enough energy to do the things you enjoy when you get home. Hi Jane- Your yarn is gorgeous. As usual, I check out your blog looking for a great picture and find one… I didn’t know my wisdom teeth could cause me problems after all these years- hope they last me a few decades more. The yarn is so gorgeous Jane – can’t wait to see you knit it up. My favorite crockpot recipe is cranberry pork roast (sauce is 1 can whole berry cran, 1/2 c. OJ, 1/2 c. wine or port) – lovely! Gasp! That yarn! Stunning! What a treat to see. Definitely mittens for that yarn.Welcome to processville. that yarn is a thing of beauty!and so’s the scarf. Beautiful yarn! I think it will make lovely mittens and a scarf. Speaking of scarves, I think Midnight Waters fits it better. It sounds like you’ve been having a lot of fun knitting. Your spinnings are beautiful. And, I’m glad that you found the right crock pot. I have one of them after going through several over the years. They really are wonderful inventions. Happy spinning and Happy Knitting! the yarn is beautiful! 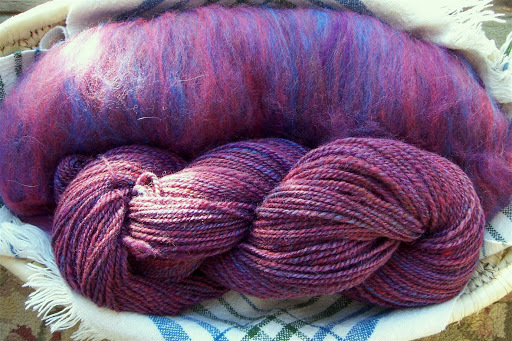 i ahve a grafton batt that i need to spin too—maybe it will be next on my list . . .
Whoa, that Corriedale is stunning!